Multi One A Day nutritional supplement is a comprehensive multivitamin and mineral formula suitable for anyone over the age of 12. Only one tablet per day is needed to support general health. It provides excellent levels of vitamins D, E, and folic acid, as well as delivering good amounts of zinc, B vitamins, vitamin K2 and select amino acids such as l-lysine and l-glutamine. Multi One A Day is a comprehensive multivitamin and mineral formula suitable for anyone over the age of 12. Consult with a medical doctor if on anti-coagulants. Provides 1000 IU Vitamin D3 per tablet, the preferred form of vitamin D. Vitamin D is helpful for supporting cellular health, healthy immune function, healthy inflammatory processes, as well as supporting bone health. Contains 200 IU of Vitamin E per tablet. Vitamin E helps to protect against damage caused by excess free radicals, especially in cell membranes and other fat-soluble areas of the body. Provides good levels of zinc, as well as selenium, manganese and copper, which are all cofactors in the body's enzymes that provide endogenous antioxidant protection. Provides high potency, balanced B vitamins, with extra B12 and 400 μg folic acid. ARE YOU GETTING ENOUGH VITAMIN D? PROBABLY NOT! Vitamin D is crucial for immunity as well as skin and bones. We are often deficient in the UK due to the lack of consistent sunshine. Most other one-a-days don’t supply this level of vitamin D.
Vitamin K is an essential nutrient to enable blood to clot properly, for supporting optimal bone and cardiovascular health and helps to balance calcium and vitamin D in the body. Deficiency of vitamin K has also been linked to age-related decline. 1 IN 10 PEOPLE DON’T GET ENOUGH ZINC! Zinc is a crucial anti-oxidant, protecting us against oxidative damage and toxicity. One in ten people don’t meet their recommended daily intake, and while most one-a-days contain zinc, none we checked contain 20mg. Low intakes of B12 can lead to energy problems, sound familiar? Almost all other one-a-day multi’s we checked contained vitamin B12 in levels so tiny they wouldn’t have any impact on health. WHY ARE THE AMINO ACIDS GLUTAMINE, LYSINE & TAURINE SO IMPORTANT? These amino acids have been carefully selected and added to Nutri Multi Essentials One-A-Day because of their well-researched ability to support gut health, immunity and the cardiovascular system respectively. This statement would be true if every day we ate a wide variety of local, seasonal, organic fruits and vegetables grown in nutrient rich soils and virgin water that hadn’t been picked green, gas ripened, irradiated, shipped, placed in cold storage, left to sit on the supermarket shelf, and then cooked within an inch of their life. Add to this list increased nutritional needs due to factors such as pollution, alcohol, stress and chronic disease, and it becomes immediately apparent that indeed everyone could benefit from an effective daily multivitamin. Each day we have a basic requirement for a range of essential vitamins and minerals; if this requirement is not met, acute deficiency diseases may result. Furthermore emerging evidence suggests that adequate daily micronutrient intake, often at intakes above the Recommended Daily Allowance, may also prevent age related disease and promote optimal health and wellbeing1. Who needs a multivitamin anyway? Despite public health recommendations only a minority of people meet the suggested 5 daily servings of fruits and vegetables2, and while there have been efforts to fortify foods with nutrients such as folic acid and vitamin D this does not ensure nutritional adequacy3,4. Importantly, multivitamins are not meant to replace healthy eating recommendations; leading experts recommend they are used as part of a healthy diet and lifestyle5,6. Nutri Multi Essentials One-A-Day contains a remarkable 1000 IU of Vitamin D3 per tablet: Vitamin D3 is the preferred form of vitamin D. At a dose of 1000IU per tablet a single daily dose will provide a level of vitamin D sufficient to ensure daily adequacy (800-1000IU daily).8 Suboptimal intakes of vitamin D are common in the United Kingdom as it is difficult to achieve adequacy through sunlight and almost impossible through food. Featuring Vitamin K2. Few multivitamin formulas contain this underestimated vitamin. While vitamin K was traditionally thought to play a role only in blood clotting, it is now understood that vitamin K plays an important role in the development of age-related disease. Vitamin K also balances calcium and vitamin D and should be considered for anyone taking these supplements9. Intakes of vitamin K are low among children, adults and the elderly in the United Kingdom10,11,12. 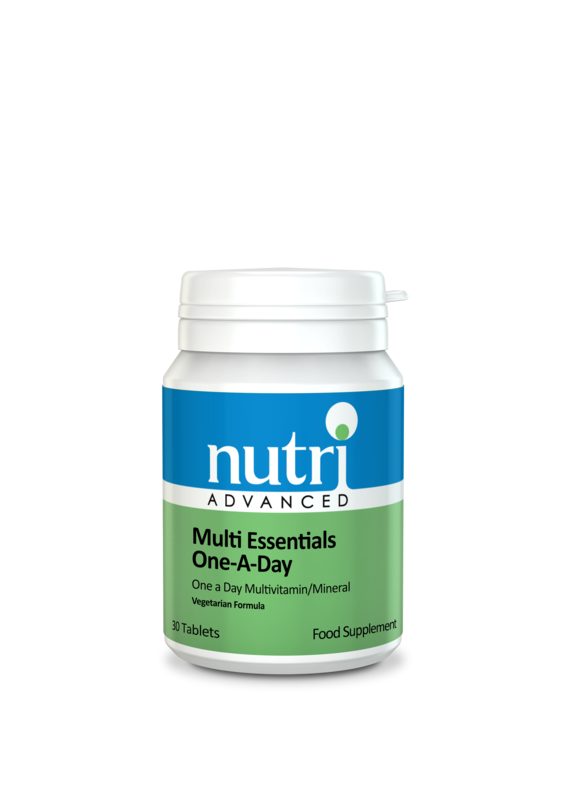 Nutri Multi Essentials One-A-Day provides high potency B vitamins, with 400 μg of vitamin B12 and folic acid. Suboptimal intakes of B vitamins, in particular folic acid, Vitamins B6 and B12, are common and the regular use of a multivitamin providing these vitamins is important for the promotion of optimal health13,14,15. Highlighting the importance of this, it has been recommended that all women of reproductive age take a daily multivitamin containing 400 μg of folic acid16. Nutri Multi Essentials One-A-Day contains 20 mg of zinc per tablet. Zinc deficiency is common with approximately 1 in 10 people not meeting their recommended daily intake. Recently the Recommended Daily Intake of zinc has been challenged by a study finding that even marginal intakes resulted in increased oxidative stress19. This report found that daily supplementation with 20 mg of zinc reduced oxidative stress. 1.Ames BN. Increasing longevity by tuning up metabolism: To maximize human health and lifespan, scientists must abandon outdated models of micronutrients. EMBO reports VOL 6 | SPECIAL ISSUE | 2005. 3. Jacques PF, Selhub J, Bostom AG, Wilson PW, Rosenberg IH. The effect of folic acid fortification on plasma folate and total homocysteine concentrations.N Engl J Med. 1999;340:1449-1454. 4.Holick MF. Vitamin D deficiency. N Engl J Med. 2007 Jul 19;357(3):266-81. 5.Willett WC (2001) Eat, Drink and be Healthy. New York, NY, USA: Simon & Schuster. 6.Ames BN. Increasing longevity by tuning up metabolism: To maximize human health and lifespan, scientists must abandon outdated models of micronutrients. EMBO reports VOL 6 | SPECIAL ISSUE | 2005. 7. Fletcher RH, Fairfield KM. Vitamins for chronic disease prevention in adults: clinical applications. JAMA. 2002 Jun 19;287(23):3127-9. 10. Prynne CJ, Thane CW, Prentice A, Wadsworth ME. Intake and sources of phylloquinone (vitamin K(1)) in 4-year-old British children: comparison between 1950 and the 1990s. Public Health Nutr 2005;8: 171–80. 11.Thane CW, Bolton-Smith C, Coward WA. Comparative dietary intake and sources of phylloquinone (vitamin K1) among British adults in 1986–7 and 2000–1. Br J Nutr 2006;96:1105–15. 12.Thane CW, Paul AA, Bates CJ, Bolton-Smith C, Prentice A, Shearer MJ. Intake and sources of phylloquinone (vitamin K1): variation with socio-demographic and lifestyle factors in a national sample of British elderly people. Br J Nutr 2002;87:605–13. 13. Dary O. Nutritional interpretation of folic acid interventions. Nutr Rev. 2009 Apr;67(4):235-44.